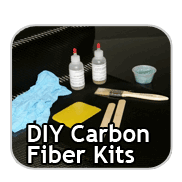 We have put together Several Real Carbon Fiber Starter Kits That you can use to make your first carbon fiber or fiberglass parts. Our kits only use the best quality 100% real carbon fiber. These kits include all of the essential materials that you will need to make your own parts. We have posted instructions, articles written by our technicians and carbon fiber tutorial resources on our website to help you learn how to use carbon fiber to wrap any part you choose. And, once you have the hang of working with our Carbon Fibre kits and Composite Materials You can use your new skills to make any part you can imagine. The epoxy system contained in our kits can be used up to 170 degrees F when post-cured properly. Everyone of our Carbon Fiber kits comes with Carbon fiber cloth and resin ready to use out of the box. You can even use our kits for carbon fiber repairs, boat repair, guitars, roofs and fenders. Every Carbon Fibre kit is made to order. So buy a Carbon Fiber kit today. Do you want to make carbon fiber parts? Our Deluxe Carbon Fiber Kit with Clear Polyester Resin co..
Do you want to make carbon fiber parts? Our Deluxe Carbon Fiber Kit wit..
Do you want to make carbon fiber parts ? Our Extra Deluxe Carbon Fiber ..
Do you want to make carbon fiber parts ? Our Extra Small Carbon Fiber K.. This kit includes all of the basic materials you will need to make a small carbon fiber part, mak..
Do you want to make carbon fiber parts ? Our Small Carbon Fiber Kit&nbs..
Do you want to make carbon fiber parts ? Our Small Carbon Fiber Kit with Clear&nbs..